I’ve been thrilled with the idea of User Mode Linux, aka UML lately. I’ve been carrying my laptop around lately, home, office, friends’, department’s labs. When I discovered UML, I noticed that I can use it as a user mode virtualization platform, I can just create a USB ubuntu distro, and run it on any machine without being root. A performance overview can be found at Alberto Garcia’s weblog, UML+skas3 and QEMU + KQEMU both requires loading kernel modules, so they’re irrelevant for me. But comparing UML+skas0 and QEMU, I would definitely choose UML. I had already seen a linux usb thumb drive belonging to a friend. He bought it online, apparently, it has QEMU on it, an X display with XFCE, it can run on windows / linux. My plan is not to have just a small usb drive, but move most of my daily usage to the usb stick — having a ubuntu on top of it, with mostly everything except my music archive. So UML is the way to go. 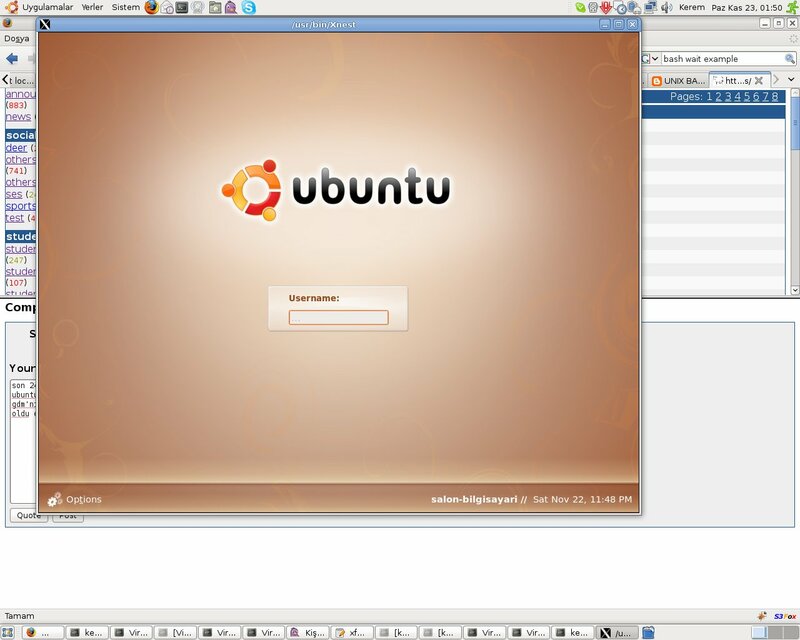 First I started off with stock UML kernel in ubuntu, and tried bootstrapping an ubuntu. After a painful process of a few days, I finally managed to do it (and hey, it is easy when you know what to do). There is a user space SLIP program, slirp, that can provide networking of IP packets. It also has other useful features I’ll visit later. After struggling for nearly 2 days, examining sources of openssh and learning most of the internals of GDM and X servers, I finally got it working. Well, almost. It doesn’t work automatically for now, I have to go and copy keys, set up slirp for tcp->stdin forwarding, setting up network by ifconfig, etc. But the good news is, it works, and it’s pretty easy to automate. When completed I’ll have a hostfs filesystem in guest that contains the xauthority keys for the host (which will be only root-readable), a gdm configuration change that runs a custom shell script as an x server, an installed Xnest (or Xephyr, I heard it’s newer and better). On the host side, I’ll have slirp, a small stdin/stdout <-> unix socket bridge application [I’m thinking of extending the right side to TCP also, so I won’t have to have a local X server, but the X server might be somewhere else (like ssh X forwarding)], and a starting shell script that prepares the hostfs’s host side, and then executes the user mode linux kernel. My solution will solve the authorization keys of the problem, and then the connection forwarding part may be implemented as part of the UML, removing the dependency on slirp and a host-application to forward the data.